I got so boosted from the two comments I got on my last post, so here's another one - now with pictures! Thanks for the comments. I've emailed Hamilton Yarns back, since you told me so, so we'll see where that leads. Anyhoo. 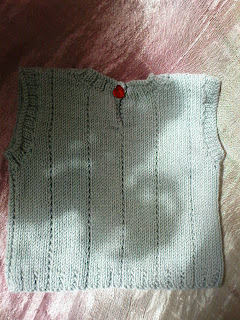 This is a "Vest" from Debbie Bliss' "Essential baby", knit in Baby Cashmerino in some pretty gray colour. 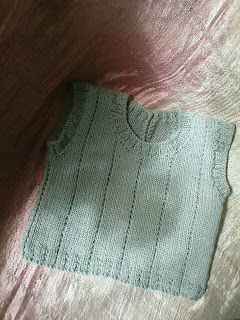 Knit in size 0-3 months on 3 mm bamboo dpn's I used slightly more than two skeins. I knit it in the round instead of back and front, and it went swell. 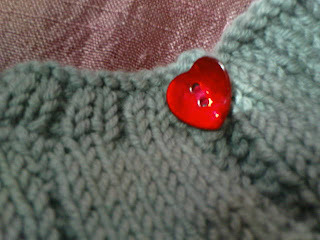 Yarnlove is powered by Blogspot and Gecko & Fly.